Does there ever need to be a reason to eat tacos? I certainly don’t think so, but today happens to be Cinco de Mayo, and that mis amigos, is all the more reason! I love the majority of Mexican cuisine I’ve encountered, especially living so close to the border. I make the occasional burrito or enchiladas, but one of my very favorites, is an order of taco shop, potato rolled tacos—I’m talking about you Bahia Don Bravo! Crispy shells of corn, covering a seasoned potato mix, topped with 27 lbs of sour cream, cheese & guacamole—it’s taco heaven, I’ve been there! These are meatless—yes, but you won’t even care by the time they’re soaking-up your salsa. This variety isn’t found on every menu, so not risking dinner disappointment, it was finally time to make my own! When you know a dish isn’t the healthiest—thanks to a deep fryer & lard—it’s easier to dine out and dismiss the decadent ingredients. So, I decided to make my version a bit lighter by baking the tacos (versus frying), using lard-less tortillas, and light sour cream. Now, before you think I’ve already completely ruined this, we’re still keeping all of the glorious toppings, flavor & crunch. I pinky swear. For my homemade version, I wanted spuds with spice, so I added green chiles, onion, garlic and jalapeño. As for the toppings, we’re fully-loaded! I can’t stand the thought of a bare shell, so we’re finishing them the best way I know how—homemade guacamole, sour cream, shredded lettuce, salsa & cheese. 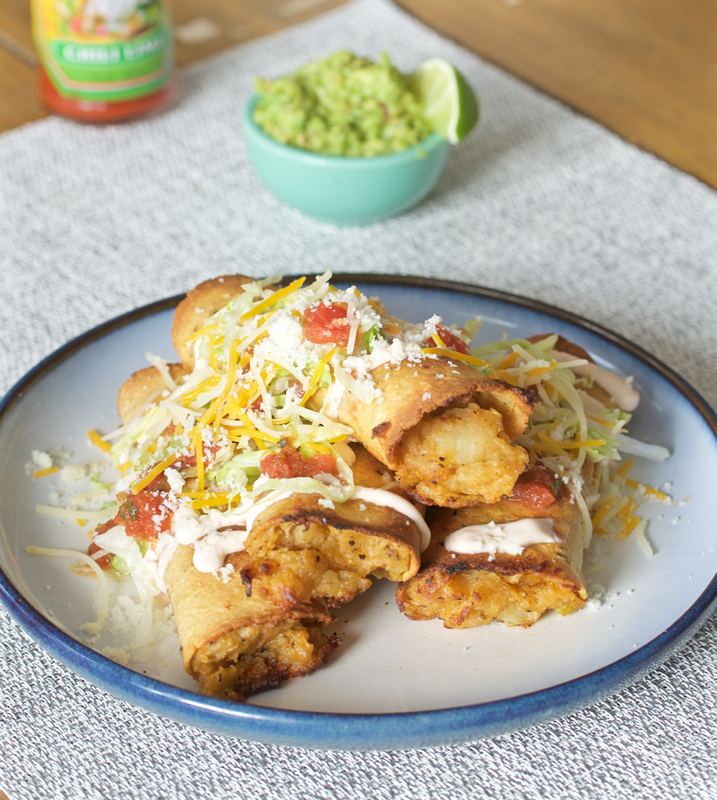 Here is southern CA, the “good” rolled taco shops always use crumbled Cotija cheese, and we’re not doing it any other way! Here’s a baked version of taco stand favorite, using mashed potatoes & diced green chiles. Peel potatoes, cut into large chunks & boil in large pot of salted water (until tender ~20 mins). While potatoes cook, sauté chopped onion, jalapeño in 1 tbsp of butter on medium-low (few mins), then add minced garlic & cook until tender, set mix aside. When potatoes are done, drain & return to pot (heat off), and let cool several minutes. While still warm, add the cream and 3 tbsp butter and mash. To potatoes add: onion-jalapeno-garlic mix, green chiles, 1 tbsp cotija cheese, salt, seasoning salt, pepper, chili powder, and mix well to combine. Line a large pan with foil, and spray with oil, preheat oven to 400 degrees. Using a pot with steamer basket/attachment, steam tortillas individually ~30 seconds (so they’re pliable for rolling), then add ~2 tbsp of potato mix down center, and roll so edges overlap on the ‘back’ of the rolled taco, and place on pan seam side down (can secure with toothpick at seam). Repeat steaming & stuffing until you have all 8 (or more if you’re doubling recipe). Brush the tops with canola oil & bake at 400 degrees for 15 mins, turn pan around & raise temp to 425 and cook ~10 more mins ( until browned & crispy, small portion of potato might leak out of end). Remove with spatula and let cool for a couple minutes on wire rack (or pan). Top with sour cream (I make a mix of lime juice, Cholula hot sauce & sour cream), guacamole, shredded lettuce, salsa, and cheddar and cotija cheeses. If worried the tacos may not stay securely ‘rolled’ while baking, they can be secured on the bottom seam with a long toothpick (I had only one that came apart when baking). I refrigerated the potato mix after mashing, and think that batch held better form when cooking. I didn’t add to much spice to the mixture, because the salsa we had was hot. Otherwise, can adjust with more or less cayenne pepper or add hot sauce into the potato mash for a kick! These are larger than taquitos, and very filling. The recipe can easily be doubled. Definitely recommend the Cotija cheese for a topping! They were really good. I can honestly tell you, because I sampled each of them, for quality purposes. I will say to achieve the same crispy texture using the oven, I had to up the temp, and bake longer than anticipated. It was hands-off time, so I prepped the toppings and made guacamole (which I inadvertently ate before they were out of the oven). It went by fast, and they only had to cool on a rack for a hot minute. If you opt to make these with corn tortillas (which is most common), heating the tortillas before filling is crucial; otherwise, they’ll break when rolling, and you’ll be taco-less & super mad. I wanted them pliable, so I decided to heat over a steamer basket on the stove. I found it worked best do each tortilla individually, fill and then roll. You could also wrap the tortillas in damp paper towels & microwave for several seconds. When rolling, I wasn’t sure if I should secure them at the seam or not. I decided not to, and all but one rebel stayed together when baking (seam-side down). For my next batch I will use a toothpick to be on the safe-side. As for the filling, you can add more or less spice—potatoes aren’t picky! I didn’t make mine with too much heat, since I topped with a spicy salsa. I often use plain sour cream, but this time I mixed with lime juice, zest, and Cholula hot sauce, you know because it’s Cinco. I’m planning to finish sampling these later and hope your night is full of festive & food!